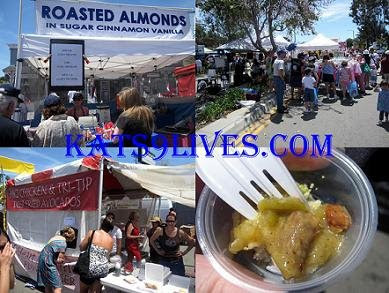 Kat's 9 Lives: Avocado Festival : Burning In Fallbrook! 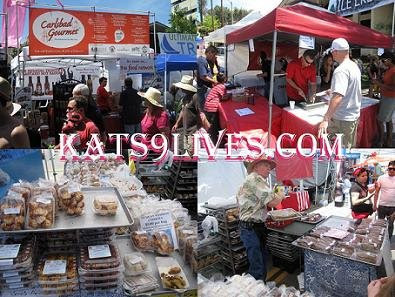 I was browsing online for interesting festivals and happen to stumble upon the Avocado Festival in Fallbrook on April 19th. How could I not go!?! I have been wanting to check out the Avocado Festival for a while and this was the perfect time. The weather had been good for the past few weeks but little did I know that it would take a turn for the worse. It was around 110 degrees in Fallbrook that Sunday! Being so smart, I totally forgot to put on sunblock. Luckily I always have light sunblock on my face or I'd probably be a red tomato! lol MBA agreed to go with me so we took a little road trip together. It is far off the path from the 5 freeway and we hit some traffic on the way there since it thins out to a small passage for a while. There are a lot of areas that offer $10 parking, but don't fall for that. When you get closer you will see there are a lot of places for street parking and if you really really want to be lazy there is $10 parking right next to the festival. Don't fall for the far away parking that charge the same price. If you are willing to walk a little bit more you can get free parking. I did wish that I had paid the $10 after being beaten down by the heat and having to hike up a hill didn't seem too appealing. 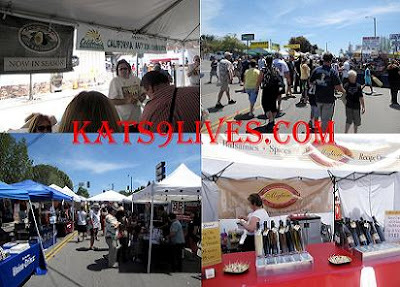 The festival is held on Beech & Main. It extends for many blocks and many booths on the side streets. There wasn't actually a lot of food on the side we entered. We were hoping to see a lot more food booths and unique mixtures of avocado. Instead there are tons of shopping and local flavor. MBA kept walking to find some food stations. The first one we happened to come upon was the Holy Guaca-Moly. They had signs posted saying they were 2009's 1st place. MBA got some Guacamole and Chips. It was very refreshing in the heat and a good start of the food to come. We kept walking in search of food and finally reached our destination towards the end of all the booths. There were tons of people and no seating area. MBA and I began to check out all the different types of food they were offering. There was some diversity in how they used avocados but not as much as we thought there would be. I saw there was Avocado Tamale with Ortega Chile and decided to take a bite. You couldn't really taste the avocado but the tamale was not too bad. The Ortega Chile gave it a nice kick. MBA decided to settle on Bacon wrapped Hot Dogs with Guacamole! ^_^ At first I was very tempted because it had two of the greatest components! Bacon and Avocado!! lol The hot dogs looked plump and juicy, but I saw some bratwursts being grilled earlier that had my name on it. I left MBA to go find my meal, but got sidetracked and decided to go try the BBQ Chicken. The chicken was tender and light, so I decided to try this booth out. Then I saw that they offer Tri-Tip along with Fried Avocados. Since there didn't appear to be anywhere to sit and enjoy the food I decided against the BBQ Chicken since it was half a chicken. In the end I decided to try their Tri-Tip, which was light and tasty. Although it was extremely hard to cut through with a dinky plastic knife. They did cook it pretty tender but that just made it harder to cut through the tendons. What a fun event! I love avocadoes so I would have loved to go if there was a festival like that in my area. Fried avocados sound especially good! Hey 5 Star Foodie! I missed you while you were gone in London! I hope you had an awesome trip! ^_^ You should totally come down and check it out sometime! 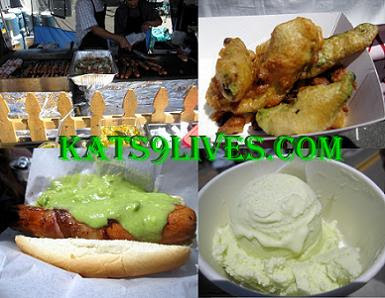 I think there is another Avocado Festival close by around October if you ever want to take a trip to So Cal ^_- Yah the Fried Avocado was delicious. I bet you can create an awesome recipe though!